Battered cod always reminds me of two things: (1) Lenten fish fries; and (2) my Grandma. 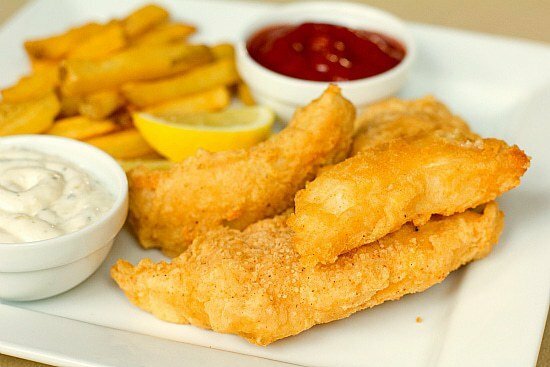 I went to Catholic school growing up and like just about every other Catholic church, during Lent ours held a fish fry every Friday. Most parents volunteered, and my parents were among them. In grade school us kids would mill about, running around and playing in the gym, while our parents spent their Friday evenings making and serving food. And without fail, we would all return home smelling like fried fish. My Grandma absolutely adored battered cod sandwiches (which I could never understand as a kid – my seafood palate didn’t extend beyond fish sticks, which for some reason I loved). Anytime we went out to eat somewhere like Eat n’ Park or Kings (local chains), she always ordered a fried cod sandwich. Needless to say, it was her menu item of choice when it came to ordering from the local fish fry and will always remind me of her. Over last couple of years, my Chief Culinary Consultant and I have enjoyed some beer battered seafood while eating both locally and at the beach. I thought that Lent would be the perfect time to try my hand at it at home, so I bought a gorgeous piece of cod and we set about battering and frying it on Ash Wednesday. I was pleased with how relatively quick and easy it was to make – the longest part was waiting for the oil to heat up in the pot! The batter has a lot of flavor thanks to the beer and a generous amount of seasoning, which complements the fish really well. 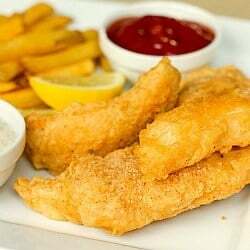 We ate our cod with tartar sauce and French fries, but I would also love to try it on a hoagie roll with pickles and tartar sauce to mimic that quintessential fish fry sandwich. This is definitely filed away under “never thought it would be so easy to make this at home!” Just make sure you have some candles to light – your kitchen will smell like fried fish! For me, it’s worth it to be able to make things like this at home, especially after my mom volunteered at the church fish fry last year and came home with some horror stories about the bulk packaged psuedo-food that they were using; a vast difference to how they did things when she volunteered some 20 to 25 years ago when we were in grade school. Such a shame, but I’m thrilled to be able to do it on my own now! What type of beer is best to use for any beer battered cod? Hi Elizabeth, Any type of lager will work! This recipe is a keeper. Delicious. Perfect. Cooked as written in recipe. Thank you. Made it exactly as the recipe said to and my oh my. YUM!!!!!!! Great recipe! Going in the box for sure. Thanks for sharing. We will make this again and again. 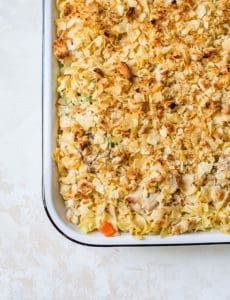 I’ve made this recipe twice now, and it’s soooo good! With oven-baked seasoned fries (chips), homemade tartar sauce, and a green veggie, it’s definitely one of my husband’s and my favorite meals! This was also my first experience with deep frying, and I found this recipe very easy to follow. I made this last night at home (in Austin, TX) with fresh-caught cod (from off Iceland) bought at Whole Foods. It was wonderful, looked just like your photo, and tasted great. I used our local Firemans #4 beer. I used a Le Creuset round Dutch oven with a mixture of canola and olive oil about 2.5 inches deep. That was enough to get the “puffed up” effect mentioned above but I could only fry 1 or 2 pieces at a time. Another old man told me the best way to reheat left-over fried fish was to use a non-stick frying pan with a tight lid. Heat it up, put the fish in, and let it sit at medium-high heat for 5-10 minutes, then turn it and wait again. There’s enough oil left in the breading to make it crispy again. I was glad I made it myself, but probably in the future I’ll stick to fish & chips at one of our local Irish-ish pubs here in town. It tasted great, but there’s a fair bit of cleanup involved, and you’re right–it still smells like a fishfry in my house. I so rarely post comments on recipes, but I stumbled upon this one last night as I was looking for a recipe for some cod I had in the fridge, and it was fantastic! My body can’t process gluten, so I subbed gluten-free flour and beer for this, and I swear no one would have known. It was so good! We put about 3 inches of oil in our dutch oven, and that was enough to “deep fry” all the fish pieces. The leftovers stayed crispy today when I warmed them up in the oven, and tasted great the second time around on toasted bread with spicy mayo and lettuce, “poboy” style. Thank you for sharing! Thanks for sharing. Tried it tonight. It was excellent! Of course another favorite! Just made this tonight. It’s was my first try with beer battered fish. We loved it! So moist and delicious! 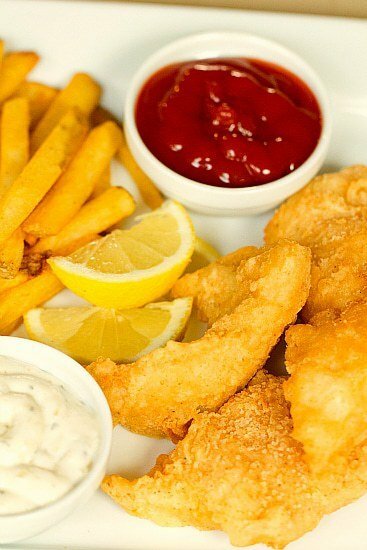 It will be my go to recipe for battered fried fish for now on! Thanks for the wonderful recipe! Just made this tonight. Absolutely perfect! So good. 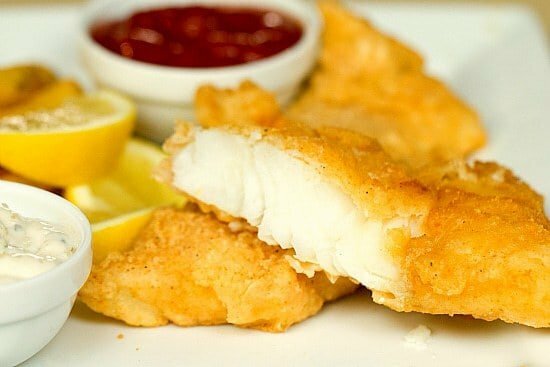 A very nice crispy batter and nice moist fish. I added lemon pepper and a little dill to the batter. Lovely :) I will definitely make this again! Made the cod the other night with this recipe – absolutely delicious. 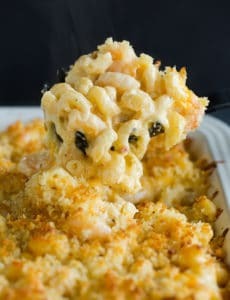 I wonder if the batter will work as well on shrimp? Going to try it tonight so let’s hope so! Thanks for the recipe and tips. I addd it to my site with some minor tweaks. Great stuff. Just made this – delicious. Thanks so much for sharing. This was amazing we had it tonight, however I ran out of dry batter and had plenty of the beer batter left. We had this with sweet potato fries and a tomato, mozzarella, cucumber salad it was divine. Thank you For the great recipe! It was the best fish I have ever made. It came out perfect and I will make this many many more times. We just made this and it turned out incredible. Crispy, perfectly textured, and paired so well with a fresh home made tartar sauce with lots of lemon. Thanks for the excellent recipe. Mmm looks so tasty! Great tip on the cornstarch. We made it for our Saturday dinner. The fish tasted very good, it was tasty even after it got cold, which is uncommon for fried fish. No taste of beer in the batter, but the spicyness was there all right. I fried it the “traditional way”, in a 4mm layer of olive oil, instead of deep frying (I thought the dish would be healthier that way). Maybe that’s why the batter didn’t really have a chance to puff up much, even with the baking powder? I think I’ll try deep frying it next time and see what happens. My basic observation about preparation, though? There just wasn’t enough dry mixture to cover all the fish bits twice! I reserved 3/4 of a cup and I ended up having to make another batch! Maybe it’s because I cut the fish into slightly smaller pieces, and I had a lot of very small “leftover bits”, so I need more flour to cover them all. Also: a lot of the dry mixture mixed with the batter I had on my hands, forming hard clumps of sticky goo which I had to scrape off and throw away (I tried frying those bits with the fish, but they weren’t that tasty). It definitely needs to be fully submerged and deep fried in canola or vegetable oil to get that “puffed up” look. The puff is from gases trying to escape as the fish fries but you don’t get the same effect with only pan frying. Hope this helps! Know exactly how you feel! Just tried it though – turned out lovely. Batter stayed crisp even though I eat very slowly, and it carried lemon juice squeezed onto it excellently (light, sharp, not soggy). I had it with mushy peas, which was nice. Yummy!!! I love fish and chips!! Would a non-alcoholic beer work just as well for this type of batter? I know it’s probably for a religious reason but if you make beer batter, any alcohol from the beer will fry off once you put it in there so I wouldn’t be too worried about it. But like I said you are probably asking for a religious reason so I don’t think you could use regular beer even then. Great recipe. 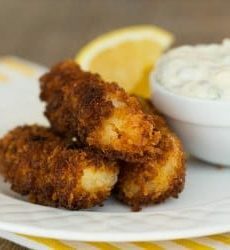 My church has the best fish fry I’ve ever tasted – so I’ll have to save this recipe for after Lent when I go into fish fry withdrawal!